Welcome to Copper State Chapter, National Society Daughters of the American Revolution! Copper State was organized on September 20, 2003. Our chapter name comes from the importance of copper in Arizona. 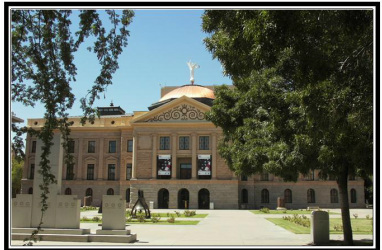 This importance is symbolized by the copper star on the Arizona State flag, dating back to 1917, and by the copper dome on the State Capitol building. From the discovery of the rich mineral deposits by prospectors with picks and burros in the early 1800s to the sophisticated, high technology industry that today makes Arizona an international business leader, copper has spurred Arizona's development and prosperity. To say that the copper industry has grown with Arizona is to understate the obvious. Arizona has grown because of copper. In the words of one Arizona copper mining executive, "What would build Arizona lay beneath the ground itself." Any woman 18 years or older who can prove lineal descent from a patriot of the American Revolution is eligible for membership, regardless of race, religion, or ethnic background. Last updated: April 7, 2019. The content contained herein does not necessarily represent the position of the NSDAR. Hyperlinks to other sites are not the responsibility of the NSDAR, state organizations, or individual DAR chapters.